CHEYENNE, Wyo. (BRAIN) — On Tuesday afternoon, Wyoming Gov. Mark Gordon signed legislation that recognizes electric bikes as bicycles and enables e-bike riders to enjoy the same paths and trails as other bicycle riders in Wyoming. WASHINGTON (BRAIN) — Rails-to-Trails Conservancy has hired Ryan Chao, currently the vice president of the Center for Civic Sites and Community Change at the Annie E. Casey Foundation, as the organization's third president. Chao will join RTC on Jan. 28. BOULDER, Colo., and WASHINGTON, D.C. (BRAIN) — PeopleForBikes and the League of American Cyclists will hold separate webinars next week addressing the midterm elections' effects on cycling. BOULDER, Colo. (BRAIN) — If ever the industry's nonprofits were in the spotlight, it was in 2018. RENO, Nev. (BRAIN) — The loss of Subaru as a corporate sponsor two years ago revealed larger issues at the International Mountain Bicycling Association. BOULDER, Colo. (BRAIN) — The International Mountain Bicycling Association has launched an online survey. The nonprofit says findings will help guide its advocacy work. IMBA worked with the SRAM Cycling Fund and Ohio University researchers on the national survey, which is open until Sept. 20. 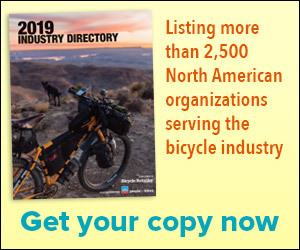 Laguna Hills, CA - With over 70 years of experience in the cycling industry, the National Bicycle Dealers Association (NBDA) knows well that the times, they are always a-changing. To that end, the organization has decided to widen its membership net to include mobile-only operators. BOULDER, Colo. (BRAIN) — The International Mountain Bicycling Association will celebrate its "Dirty 30" anniversary, October 26-28, 2018, in Bentonville, Arkansas, during the Outerbike demo event. CHICAGO (BRAIN) — The Chicagoland Area Bicycle Dealers Association is increasing its support of the Professional Bicycle Mechanics Association. The dealers association, which plans two trade shows next year, is providing six scholarships for bike mechanics to attend upcoming workshops conducted by the PBMA. BOULDER, Colo. (BRAIN) — The Bicycle Product Suppliers Association plans two new e-bike training programs for retailers. The BPSA board approved the programs at a recent meeting here. BOULDER, Colo. (BRAIN) — The International Mountain Bicycling Association is now accepting applications for the next class of IMBA Ride Centers. BOULDER, Colo. — Camber Outdoors has announced seven June events in its 2018 Camber Exchange series. AUSTIN, Texas (BRAIN) — The Professional Bicycle Mechanics Association is now offering bike shops — including mobile and service-only operations — the opportunity to be designated as PBMA Certified Shops.